Sylenth1: big synth, big sounds! Compared to the current generation of deep, complex virtual instruments, LennarDigital's Sylenth1 is a relatively basic soft synth. Its simple subtractive architecture is based on four oscillators, two filters, two LFOs, two modulation envelopes and a handful of built-in effects. However, despite the synth's modest set of features, it's maintained its position as one of the most popular plugins on the market since its release in 2006, and remains the go-to virtual analogue instrument for many top producers. 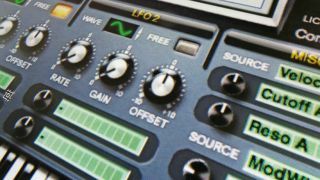 In this walkthrough, we'll show you how to turn Sylenth1's power-packed oscillators and unison mode to the generating of massive stacked chords. For more on Sylenth1, get your hands on Future Music 284, which is on sale now. Step 1: Sylenth1 is the perfect synth for creating stacked EDM-style supersaw chord sequences. Begin by initialising a new instance of the plugin on a blank MIDI track, then loop up a four-bar chord progression. The initialised synth currently only plays back three sawtooth notes at a time, so increase the Polyphony to maximum (16). Turning up Part A's Amp Env Release adds some length to each note. Step 2: The synth is made up of two Parts - A and B. Each part houses two oscillators and a filter. Each oscillator can output up to eight unison voices, so increase Oscillator A1's Voice number to 8, thickening out the sawtooth tone. To prevent clipping the synth's output, pull down the master volume fader. These eight voices are all being triggered from the same point in the waveform, so turning off the Retrigger switch allows these voices to run freely. Step 3: By increasing the Detune dial, we can detune the pitch of these eight voices, creating the classic detuned 'supersaw' sound heard on countless dance records. Copy and paste Oscillator A1's settings over to Oscillator B1, pulling the Octave setting down to -1. These settings are also pasted over to Oscillator B1, which is then transposed down -2 octaves and detuned even more. The result is a thick, detuned supersaw chord that spans three octaves. Step 4: To help the chords tear through a mix, turn Oscillator B2's Voices up to 8, changing the waveform to Noise. We only mix a small amount of this noise in behind the saw oscillators for a subtle touch of treble fizz. Sylenth1's built-in EQ is used to boost the upper-mid frequencies slightly at about 1kHz, tilting the overall frequency response of the chords towards the upper mids and brightening up the synth sound for more bite in the mix. Step 5: Our synth's channel is now duplicated twice. On one instance, we isolate only the MIDI clip's bass notes, then program a simple pitched-down sawtooth. This layer backs up the main chord sequence in the lower registers. To add to the riff's overall timbre and character, the third instance only plays the top line of notes of our MIDI sequence, triggering a basic single-oscillator pulse-wave patch, which provides a nice tonal contrast to our other layers. Step 6: By bussing our three synths to a single group, we can gel the layers together with processing. EQ is used to roll off unnecessary bass and treble, compression glues things together, brickwall limiting catches rogue peaks, and sidechain compression gets the riff pumping. We haven't used Sylenth1's built-in reverb or delay on the layers, instead applying third-party reverb and delay via auxiliary channels.